The town is well known amongst tourists. It is located in the centre of Switzerland in close proximity to the Alps. The Aare River flows through the town. The town takes its name from its geographical position: between the lakes (in Latin inter lacus). Interlaken is located between Lake Brienz to the east and Lake Thun to the west. Interlaken is located at 570 metres above sea level. The original importance of the town was as the site of a convent of the Augustinian canons. The convent was built in 1130 and lasted until 1528. It later grew popular as a tourist resort. It is one of the oldest tourist resorts in Switzerland and remains one of the most popular ones. Tourists are often disappointed by the appearance of the town itself, but it is the magnificent view of the Jungfrau mountain (4158m) that attracts them. Many hotels are located along the Hoheweg avenue which has good views on the mountains. In the past textiles and to a smaller extent watchmaking were of importance, but today tourism is the most significant source of income. Despite its small size (population 5200), the town features two train stations, including the funicular railway Harderbahn. Well, I just love trains and cogwheels trains even more. We rushed to Lucern from Paris to go up Mt. Pilatus on the World's 'longest and highest' cogwheeled railway. While in Lucerne, I happened to see a map of the many trains, cogwheel railways etc around and about Interlaken. As you can imagine, at the next drop of a hat, we were of to Interlaken. 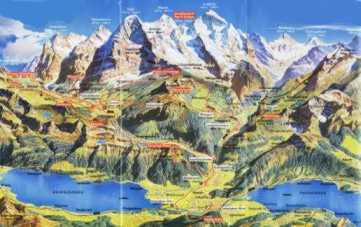 Two of the most interesting railways or combination of railways, gondolas, chairlifts are to Jungfraujock and Schilthorn.